Major aortopulmonary collateral artery (MAPCA) is rare type of congenital heart disease. The therapeutic management of MAPCAs requires creation of a good pulmonary artery (PA), and varies depending upon the pulmonary vascular bed.1) Patients who have pulmonary segments supplied only by MAPCAs require unifocalization (UF),2, 3) whereas patients who receive pulmonary blood supply via a native PA as well as via the MAPCAs, a so-called “dual supply”, do not always need UF. In these cases, a surgical systemic pulmonary shunt or connection of the right ventricle to the PA is an option for rehabilitation of the native PA.4, 5) In either case, multistage surgical management is necessary in cases of diminutive native PAs. We report two cases of successful transcatheter rehabilitation of the native PA in patients with MAPCAs and diminutive pulmonary antegrade flow, using balloon valvuloplasty (BVP) for pulmonary valve and transcatheter arterial embolization (TAE). Definitive repair was achieved without surgical intervention for the PA. Written informed consent was obtained from each patient’s family before the procedure. An infant weighing 3438 g was delivered vaginally at 39 weeks’ gestation. He was diagnosed with pulmonary atresia, ventricular septal defect, and MAPCAs by fetal echocardiography. In addition, rectal-cutaneous fistula, bilateral inguinal hernias, and 22q11.2 deletion syndrome were also present. He was transferred to our hospital at 3 months of age for cyanosis and diagnosed with a double outlet right ventricle, subarterial (doubly-committed) ventricular septal defect, pulmonary valve stenosis with a 52 mmHg pressure gradient involving a diminutive tethered pulmonary valve (diameter: 3.7 mm, z score: −6.4), right aortic arch, and MAPCAs via echocardiography. His clinical condition was almost stable with 75% of oxygen saturation (SaO2) at the time of admission. The first cardiac catheterization revealed five MAPCAs originating from the subclavian artery, descending aorta, and celiac artery (Fig. 1A–E), and a diminutive native PA (PA index [PAI] 49 mm2/m2)6) (Fig. 1F). Each MAPCA had sufficient dual supply with the native PA. In other words, the native PA was connected to the entire pulmonary vascular field. The initial BVP was performed with full expansion of a 5.0 mm Tyshak II balloon (NuMED, Hopkinton, New York). Immediately after balloon deflation, the patient’s SaO2 increased to 85% and TAE of the four MAPCAs was performed in order to promote rehabilitation of the native PA. The post-interventional course was uneventful, and SaO2 was 85% at discharge from the hospital. At 7 months of age, he received a second cardiac catheterization. The native PA had grown to a PAI of 87 mm2/m2 and TAE of the minor aortopulmonary collateral arteries was performed. Because of the onset of cyanosis, a third cardiac catheterization was performed at 11 months of age. The native PA had grown to a PAI of 137 mm2/m2 and the second BVP was performed for the pulmonary valve (diameter: 6.5 mm, z score: −3.6) with full expansion of 7.0 mm and 8.0 mm Sterling balloons (Boston Scientific, Natick, MA). The patient’s SaO2 increased from 75% to 85% and TAE of the one remaining MAPCA was performed. After bilateral inguinal hernia repair surgery, a final cardiac catheterization was performed at 20 months of age. It revealed good pulmonary vascular condition with acceptable mean pulmonary artery pressure (15 mmHg), pulmonary vascular resistance (1.8 U・m2) and PAI (135 mm2/m2 :Fig. 1G). TAE of the residual minor collateral arteries was performed. During this period, pulmonary valve regurgitation remained at a mild level. At 25 months of age, he underwent a complete repair with a transannular patch. The postoperative course was uneventful, and echocardiography indicated acceptable right ventricular pressure; tricuspid regurgitation velocity was 3.1 m/s and inter-ventricular septum was round during systole in short axis view. An infant weighing 2610 g was delivered vaginally at 37 weeks’ gestation. He was transferred to our hospital on the day after birth for cyanosis and was diagnosed by echocardiography with tetralogy of Fallot, subarterial ventricular septal defect, pulmonary valve stenosis with a 39 mmHg pressure gradient involving a diminutive tethered pulmonary valve (diameter: 3.7 mm, z score: −5.5), and MAPCAs. He was also diagnosed with 22q11.2 deletion syndrome. His clinical condition was almost stable except for SaO2, which decreased from 85% to 65% at 1 month of age. The first cardiac catheterization revealed four MAPCAs originating from the subclavian artery and descending aorta (Fig. 2A–D), and a diminutive native PA (PAI 49 mm2/m2) (Fig. 2E). Each MAPCA had a sufficient dual supply with the native PA. In other words, the native PA was connected to the entire pulmonary vascular field. The first BVP was performed with full expansion of a 5.0 mm Sterling balloon (Boston Scientific, Natick, MA). Immediately after the balloon deflation, the patient’s SaO2 increased to 80%. The post-interventional course was uneventful, and the patient was discharged from the hospital. At 9 months of age, he received a second cardiac catheterization. The native PA had increased to a PAI of 147 mm2/m2, and a second BVP was performed to the pulmonary valve (diameter: 6.3 mm, z score: −4.0) with full expansion of a 7.0 mm Sterling balloon (Boston Scientific, Natick, MA) and 8.0 mm Tyshak II balloon (NuMED, Hopkinton, New York). The SaO2 rose from 80% to 88% and TAE of four MAPCAs was performed. After waiting for growth of the PA, a third cardiac catheterization was performed at 16 months of age. It revealed good pulmonary vascular condition with acceptable mean pulmonary artery pressure (11 mmHg) and pulmonary vascular resistance (1.1 U・m2). The native PA had grown to a PAI of 229 mm2/m2 (Fig. 2F) and the third BVP was performed on the pulmonary valve (diameter: 8.1 mm, z score: −2.7) with full expansion of a 9.0 mm Tyshak II balloon (NuMED, Hopkinton, New York). The patient’s SaO2 increased to 90% and TAE of the residual minor collateral arteries was performed. During this period, pulmonary valve regurgitation remained mild. At 21 months of age, he underwent a complete repair with a transannular patch. The postoperative course was uneventful, and echocardiography indicated acceptable right ventricular pressure; tricuspid regurgitation velocity was 2.8 m/s and inter-ventricular septum was round during systole in short axis view. Transcatheter rehabilitation of the native PA, rather than surgical intervention, was selected for two infants with severe cyanosis. A series of interventions with BVP and TAE were performed to promote native PA growth and maintain SaO2 without any complications. After growth from a diminutive PA to an appropriately sized PA, complete repair with a transannular patch was performed, without any surgical PA rehabilitation strategies. There are two major strategies for management of patients with MAPCAs. The first is to use MAPCAs for UF in one or multiple steps towards surgical repair.2, 3) The second is rehabilitation of the native PA with a systemic pulmonary shunt or connection of the right ventricle to the PA in order to promote native PA growth.4, 5) The optimal strategy selected depends on whether there is a native PA, its size and supply segments when present, and variations of MAPCA in the size, number, position, supply segments, and presence of dual supply to the native PA. Although there have been several reports of TAE of MAPCAs,1, 7) these two cases were rare in that complete transcatheter rehabilitation of the native PA using BVP and TAE was achieved without surgery. This strategy had been evaluated as an option for avoiding palliative surgery in early infancy, which is associated with a relatively high mortality.8) This strategy could improve mortality and morbidity using procedures that are relatively familiar to pediatric cardiologists, such as BVP and TAE. 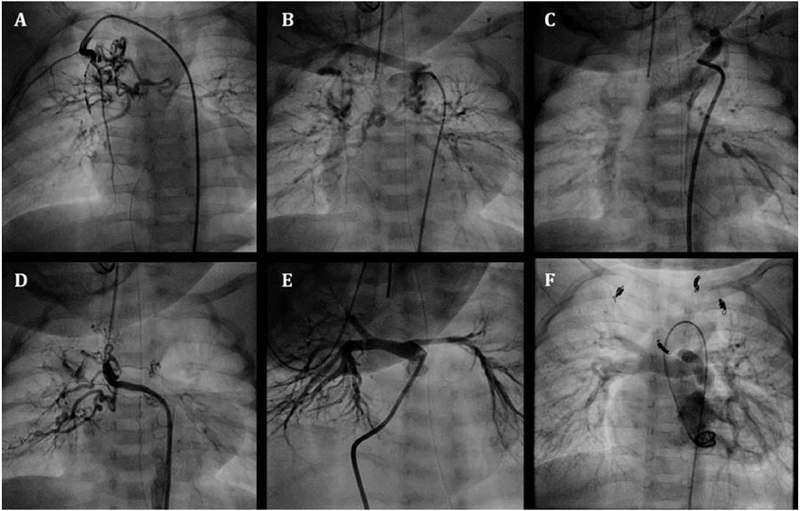 It did not matter whether dual supply was sufficient or not in these two cases, because there were obviously strong connections between the native PA and the MAPCAs identified by angiography. By contrast, we occasionally perform test occlusion of the MAPCAs if their connections seem to be insufficient. The qualitative and quantitative evaluation of sufficient dual supply is an unresolved issue that needs to be clarified in the future. Transcatheter rehabilitation of the native PA without surgery creates options for patients with MAPCAs and diminutive pulmonary antegrade flow. The essential factors for this strategy are sufficient dual supply of the native PA and MAPCAs and presence of a subarterial ventricular septal defect. The authors would like to thank all of the physicians, nurses and technicians of our catheterization laboratory, for their professional contribution and help with this case report.